Wait, is this not available anymore already? I just had it this past weekend but it's already off the DD website (they are pretty attentive to staying up to date). They still show the Strawberry Banana and Tropical Mango smoothies, but not the wildberry one. You know why that might be? Because it's terrible. That or because we are nearing the end of summer (I know, I know, it hurts to say it). Now I don't say that lightly, but yeah, I hated this from the first sip. I watched the server make it and it's definitely not a real smoothie. Real smoothies are a fun mix of dairy products, ice and real fruit, all nice and blended up. This was basically a coolatta with milk mixed in. It's pretty pathetic. Granted, there must be some fan base to this, but it was just sad. 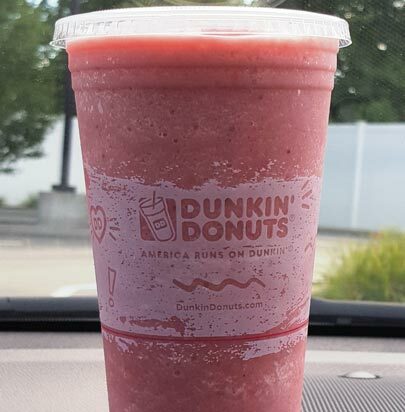 It was a bunch of the usual coolatta liquid, what looked like milk, three tablespoons of some frozen fruit substance, and some coolatta ice. Blend it all together and you have a "smoothie" --- Yes, I know it says yogurt, and maybe they have a yogurt jug that looks like milk, but it REALLY looked like milk. Sure you could argue that maybe they ran out of yogurt, but then you say "sorry sir, I can't make you a smoothie right now". This drink was just awful though. You ever eat flavorless strawberries? That's what this reminded me of. The milk and ice mix was unpleasant as well. I even tried adding a bit of sugar to it once I realized we couldn't finish it. I say we because my wife didn't like it either. She did her best to help me through it but it just wasn't enough. Total fail on this one. These are just as bad as the first time DD did smoothies a while back. Have you tried the milkshakes from DD yet? The strawberry tastes like icy Nesquik.